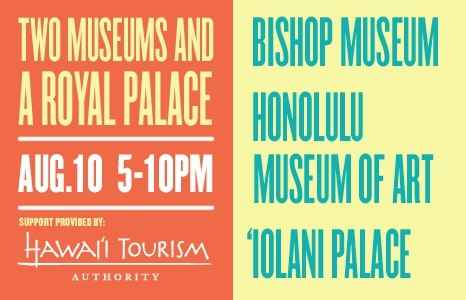 In an unprecedented move, the museum teams up with Bishop Museum and ‘Iolani Palace for a night of cultural exploration and fun. Visitors can take free shuttle buses between the venues to fully experience Honolulu's first ever culture hop. You can join in the event at any location. Wherever you start, you will receive a wrist band that will allow entry to all three venues. Buses will leave each venue every half hour, at 15 minutes past the hour, and 15 minutes to the hour. Admission: $10 adults, $5 children 4-12, children 3 and under are free. Includes entry to all three locations. Free for members of all three institutions. Each location will have a different experience, with special programming created just for the event. • "Living art"—featuring docents dressed as some of the museum's notable artworks, such as Whistler's Lady Meux. • Film: 7-10pm: The award-winning short animated films Why Maui Snared the Sun, Menehune and the Birds, and Pele Searches for a Home. • Hawaiian Hall, J. Watumull Planetarium, and Mamiya Science Adventure Center open. Offerings including planetarium programs, cultural storytelling, an interactive hula program, and docent-led guided tours through Hawaiian Hall. Families can enjoy educational art activities related to two upcoming exhibitions, Textured Lives and HI Fashion: The Legacy of Alfred Shaheen while live music, three food trucks, and a no-host bar round out the evening’s events. • Rare event! : Second-floor will be open. ‘Iolani Palace is normally open to the public at night only one night a year, in December. • Pianists Aaron Sala, Iwalani Apo, and Grant Mack will play period music inside the palace. • Matt Sproat, of Waipuna, and DJ Heavy Beat perform in the Barracks Beer Garden.